Got a little distracted and skipped ahead of my own plans/schedule. Tested out a few paint & wash combos on some skeletons. I'm looking for some armored skeletons to use for elites. Preferably heavily armored. If there aren't any actual undead to fit what I'm looking for, I've been contemplating a few different historical ranges and then swapping some of the helmets for skulls and "roughing up" some of the other equipment. Yeah, unfortunately these guys are a pretty bulky and will cause visual/scale issues for just about everything else on the table. But I've had them sitting around for years & figured I may as well use them. I'm looking for something more armored than their regular skeletons. The grave guard are nice (if I cut the ridiculous headgear off) but more than I'm willing to pay. I need a unit of about 16 -- that would run over $80! 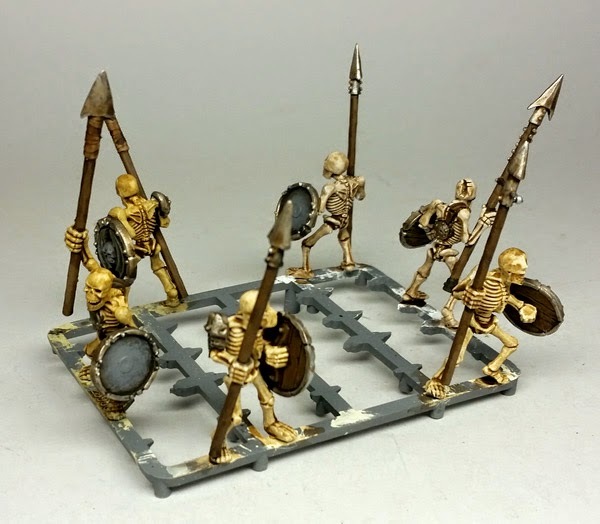 One of the nice things about skeletons is that you can paint them in a variety of ways and they usually come out to a nice table top standard.